The ancient capital was Crï¿½achu (Crï¿½achan, present day Rathcroghan in Co. Roscommon). A few of the legendary persons or groups associated with this province are King Ailill and Queen Medb, and Findabair (Gwenivere), who was the daughter of Ailill and Medb. Near present-day Sligo Town is Knocknarea (the legendary burial place of Medb), Benbulben, and Drumkill. 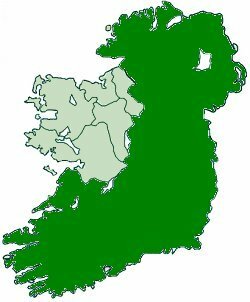 In the Ulster Cycle, Connacht is the enemy of the Ulaid, but this may obscure the probable historical conflict between Mide under the Uï¿½ Nï¿½ill and Ulaid. Medb is said to be the daughter of the king of Temuir.